Because how often do we stick with our original crew when it comes time for lunch? Step outside of your comfort zone. Sit with a new person at lunch today, or ask them to join you if you're going out for lunch. You're guaranteed to learn something new and you may make a new friend too. 1. Offer up your seat. You know what it's like to be in a crowded waiting room, or to have your arms full of bags and no where to sit on the bus. If you see this happening, offer up your seat. You're guaranteed to make all the difference in the world to the right person. 2. Give a genuine "hello" and "how are you?" to the doorman. Maybe you see him/her everyday, or maybe you just met because it's a new building you're walking into. Either way, a kind greeting and a smile can go a long way. 3. Pay a compliment. It's almost too easy and it can go a really long way. "I really love those glasses!" "You did a great job on that report yesterday." "You're awesome, just had to let you know." Get the picture! So easy, and quite the day maker! 4. Let a friend know what they mean to you. So easy! "I really appreciate you, I'm so glad we're friends :)." Who wouldn't smile at that and feel amazing after hearing that. I think we need to hear this more often from those whom we love the most. 5. Hold a door. Hold an elevator. Do it on purpose. You see someone a few feet away out of the corner of your eye, be mindful and walk through the door slowly to give them time to catch up, then hold it for them. Door holding is almost a lost art, but it's always appreciated when it happens. Who doesn't love hearing that the outfit they picked out today is spectacular, or that they did a good job on a project at work. This goes back to that weird notion that it's easier to complain when something goes wrong than to acknowledge when something goes right. Let's break that cycle and pay compliments when they are due. This suggestion comes from Kim Webb, who's a part of our Facebook Event community. "I gave some of my daughter's clothes/shoes that couldn't fit her anymore to my co-worker when I did she was sooo overjoyed and thankful..she couldn't Stop thanking me..I said no worries and just smiled"
Traffic can be the most stressful situation of all. Especially commutes to and from work. Be a Day Maker by allowing someone to merge in front of you or turn into your lane. 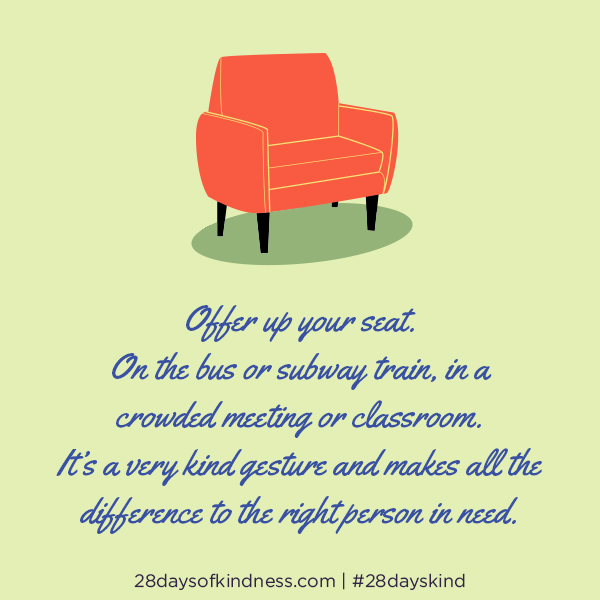 It's a simple act that goes a long way. If you happen to exchange glances, add a wave and a smile. Sure, we all have books that we treasure and change our lives, but then we also have a whole lot of other books that sit on our shelves and take up a lot of space. When thinking of those other books, how often do you actually read those twice? They would serve the world better if you donated them to a local library or school. You can also pass them along to your friends, and ask them to continue to pay them forward (if you do that, have them sign their name and date they completed reading the book before they pass it on, and your books take on a history of their own).